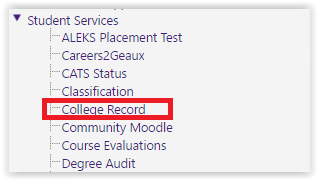 The College Record is an unofficial transcript that can be printed for your personal records. For an Official Transcript, go to the myLSU Portal, click Student Services | Transcript Request. View detailed instructions on requesting an Official Transcript. 2. On the left-hand side panel, select Student Services | College Record. 3. A new window will open giving you the option to Print College Record. There are links to the LSU General Catalog and contract information for the Office of the University Registrar | registrar@lsu.edu | 225-578-1686.